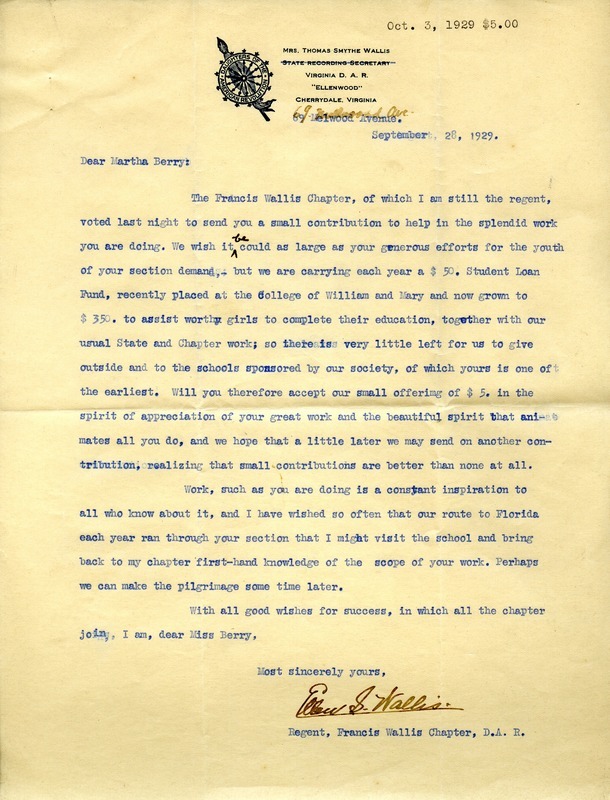 Letter to Martha Berry from Mrs. Thomas Smythe Wallis, the Regent of the Francis Wallis Chapter of the DAR, informing her of the small contribution of $5 that they are offering to the Berry Schools. Mrs. Wallis regretfully informs Miss Berry that their donation cannot be more because of the support that they are giving to the College of William and Mary. Mrs. Wallis also praises Miss Berry on the work that she does at the schools and expresses her wish to bring to their chapter once again, first hand knowledge of the wonderful work she is doing at her schools. Mrs. Wallis also informs Miss Berry that she would like to arrange a visit to the schools at a later time to do so. Mrs. Thomas Smythe Wallis, “Letter to Martha Berry from Mrs. Thomas Smythe Wallis.” Martha Berry Digital Archive. Eds. Schlitz, Stephanie A., Haley Fortune , et al. Mount Berry: Berry College, 2012. accessed April 21, 2019, https://mbda.berry.edu/items/show/9965.